As you know, this week marks Casual Runner’s First Anniversary, and we could not be more excited to celebrate it with you, our readers and fellow Casual Runners. In the year since we logged our First Mile as a website, we continue to be amazed by the response we receive from fellow Casual Runners and what we learn from one another along this great Casual Running adventure. We decided that it would be appropriate to cap-off our week long anniversary celebration by allowing the members of Team Casual Runner to share with you some reflections and some of the things that we learned from our fellow Casual Runners during this first year. Most of you may not know the origin story of Casual Runner. It really started by accident when I ran my first half marathon, the 2013 runDisney Princess Half Marathon. After the race, Nick insisted that I post pictures of my SMO to social media. Then he started asking me to fill him in on the race itself. 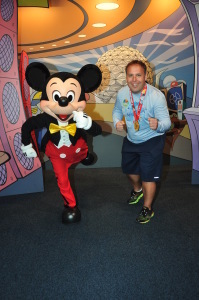 Mickey Mouse provides Mike with some Casual Running tips…nice form Mickey! Over the next few months, when Nick and I would talk, we would share running stories, and he flippantly suggested that I should start blogging about my experiences. After some back and forth, I told him that I would only do it if he would do it with me. After all, everything is better with a running buddy. 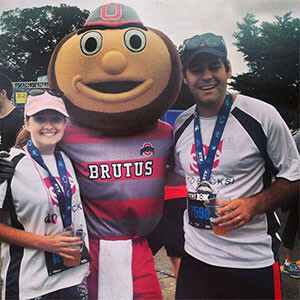 He agreed, and so Casual Runner would be born out of a simple idea: Casual Runners sharing their experiences to help educate and empower fellow Casual Runners. As running is always better with friends, I asked Jennifer if she wanted to participate, and before I knew it, she was in, as in, ALL-IN. And we were off and running! In short order we would add Steve and Jake to the Team, and Casual Runner has really taken off through the efforts of a wonderful group of running buddies. But, through it all, Casual Runner remains a place where Casual Runners can share with and learn from other Casual Runners. We have always embraced the notion that there is no right or wrong way to approach Casual Running. Whether you aim for faster speeds to be at the front of the pack or are content with wherever your natural pace may place you; whether you are a runner, a walker, a jogger, or a Gallowalker; and whether you are happy as a 5k or 10k runner or if you care to take on the half marathon or marathon distances, the key is that you should approach Casual Running in a way that you will enjoy it. What matters is your enjoyment of your own experience, not what anyone else says or thinks. The moment where I really learned this lesson was when a guest contributor, Jen, submitted her First Mile piece to us to publish. In it, she recounted that the hardest thing to get over for her in her Casual Running journey was the memory that, on her high school soccer team, running was a punishment. Because of this, she had to learn to get over her mental block of thinking of running as a punishment, and learn to enjoy it for what it is. She had to learn to run her way, no matter what anyone else may think. And so must we all. However it is that we all came to Casual Running, we are here, and as long as Casual Runner continues to move forward, we will all have a place to enhance our enjoyment of this wonderful Casual Running adventure that we all find ourselves on. When I look back on the past year of Casual Runner one of my favorite series is the First Mile series — especially Ryan’s, which continues to inspire me whenever I feel like I want to give up. Remember folks, with Casual Running, Adventure is Out There! I also really enjoyed reading about other races and was motivated to find the Baltimore version of the Pro Football Hall of Fame Gold Jacket 5K race after reading Steve’s race review, because…OMG that bling! But I think the most enlightening posts are Jake’s CosRunning series. Sure, I live with the guy and he creates much of what I end up wearing in my races. So you would think I would be familiar with how he does it. But he does most of his costuming when I’m out of the house or otherwise occupied, so I rarely get to see his process. I’m incredibly proud of his creativity and artistic ability, and this series gives me a greater understanding of how Jake creates the cool stuff we wear. The most amazing thing that I’ve found about this past year is the many, many, reasons that Casual Runners have that motivated them to take that initial step and run their First Mile. Some did it for health reasons. Some were encouraged by friends or even family to take that first step. Some did it to get a break from studying, like, yours truly. Of course we are going to use our favorite picture of Steve in an anniversary piece. Some did it to go on vacations and others did it to go home. Some have overcome amazing personal challenges, and some have set challenges for themselves. And that is the beauty of running your First Mile: there is no wrong reason to start. 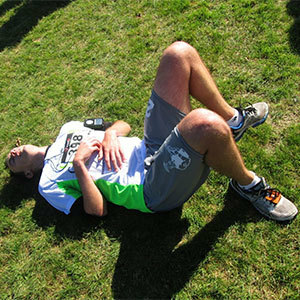 So, to all soon-to-be Casual Runners out there, take a look inside and figure out what will encourage you to run your First Mile, work towards your own personal starting line, and, soon enough, you will be toeing the line at your own first race knowing full well that your hardest (and most important) mile has already been run. I joined the Casual Runner Team a little later than the rest of the team. I spent the first several months of Casual Runner’s existence as simply a reader. I was a participant in most of the races Jennifer reviewed, so I was interested in her perspective of each race and enjoyed being able to look at them through fresh eyes. But I never really gave writing for the site any thought. 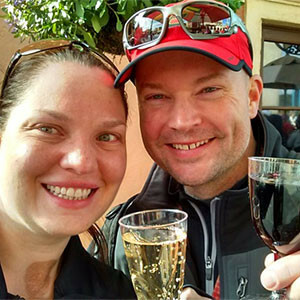 Jennifer and Jake raising a glass to celebrate another great Casual Running adventure. 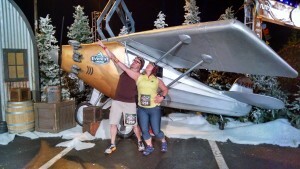 It wasn’t until Walt Disney World Marathon Weekend that I really gave joining the Casual Runner Team serious thought. It actually kind of started as a joke, giving Mike a hard time about never asking me to write anything for the site. He asked if I’d want to share my First Mile story and the rough outline for the story came together in my head pretty quickly. I had something to share that I thought people might find interesting. It also came at a time that running was becoming MY thing, and not just something that I was doing to support Jennifer. As an artist, I have always expressed myself more with pictures than words; I never really thought of myself as a writer. I guess the number one thing I learned from Casual Runner this year is that I am also a writer. I know that you have not seen too many features from me in the first year of Casual Runner, as my role on the Team has been more on the back end keeping things running on the site (but I do always make sure to pop up when the Team puts these collective pieces together). In this role, I have had the pleasure of seeing everything that the other Team Members and my fellow Casual Runners have contributed over the past year. And doing so reminds me that we all have our own stories to tell and experiences to share. Nick’s lovely wife Brit, Nick’s first love Brutus, and Nick. There are those who take running seriously, maybe even too seriously. I prefer those who take more of a lighthearted approach to this endeavor – after all, Casual Running is supposed to be about recreation and making yourself feel better. It is supposed to be fun. I care more about the costumed runners having fun in the back of the pack than I do about the people who break the tape at the finish line. I love seeing Casual Runners supporting fellow runners. I love seeing all of the cool new gear and creative designs for race medals, which leaves wondering what my fellow Casual Runners will come up with next. I may not run as many races or log as many miles as other runners may, but you can bet that every mile that I do run will be one that I will enjoy, because I will be running casually! The Casual Runner Team thanks you for all of your support during our first year and for making it such a great success. We look forward to continuing this great Casual Running Adventure into year #2 and beyond! If you want to tell your story and be a part of inspiring fellow Casual Runners on their journeys, please let us know, we would love to hear and share your stories.